Home > News > News > A Bewitching Offer from AMT! 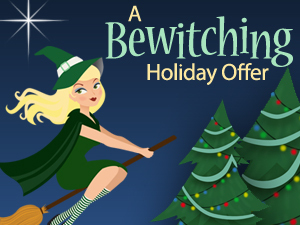 A Bewitching Offer from AMT! Purchase your tickets to The 2013 Christmas Show: The First Noel on Wednesday or Thursday, October 30 or 31, and receive $7 off* each adult ticket. Christmas at American Music Theatre comes with more enchantment and splendor than the North Pole itself! A number of show dates are filling up quickly, so don’t let Halloween scare you into missing this great offer. Visit the box office, call us at 800-648-4102, or click here to get your favorite seats now before they disappear! *Valid for up to four regularly priced, adult tickets to The 2013 Christmas Show: The First Noel only. New orders only. May not be combined with other offers. Offer valid October 30-31, 2013 only. Use code BEWITCH when ordering.